Fastener failure on a product can have potentially disastrous consequences. In an attempt to ensure that such consequences do not occur, rigorous and extensive testing of a product is frequently completed. However in many applications, extensive testing is neither practical nor economic. In such instances, the Engineer usually relies upon analytical analysis together with his experience and judgment to ensure that failure does not occur. The majority of fastener failures occur with fracture through the male thread. Under static loads, the strength of the thread is determined by the stress area. This is based upon the mean of the minor and pitch thread diameters. Engineering handbooks have, typically, tables of stress areas for various thread sizes. When a bolt is tightened the shank sustains a direct stress, due to the elongation strain, together with a torsional stress, due to the torque acting on the threads. Most tables of bolt tightening torques ignore the torsional stress and assume a direct stress in the threads of some proportion of the bolts yield stress, usually 75%. For high frictional conditions the magnitude of the torsional stress can be such that when combined with the direct stress, an equivalent stress over yield can result, leading to failure. A more consistent approach is to determine the magnitude of the direct stress which, when combined with the torsional, this will give an equivalent stress of some proportion of yield. The proportion commonly used with this approach is 90%. The computer program TORQUE provides state of the art analysis for the torque tightening of threaded fasteners. 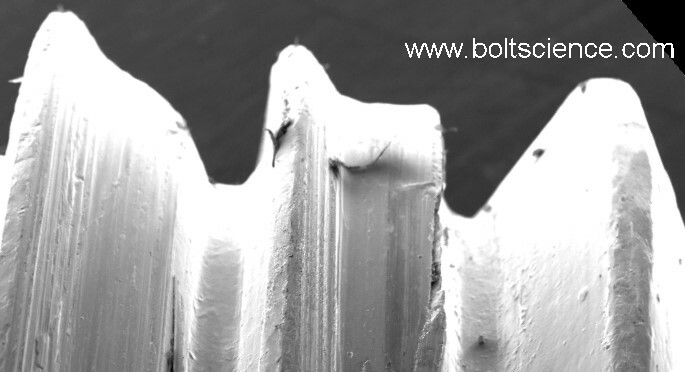 High performance bolts are often designed so that the plain shank is smaller than the stress diameter of the thread. This is done so that the stretch that occurs under the preload induced from the tightening process is maximised. With this type of bolt, failure, if overtightened, will occur in the plain shank region as shown in the photograph. Thread stripping can be a problem in many designs where tapped holes are required in low tensile material. In general terms, thread stripping of both the internal and external threads must be avoided if a reliable design is to be achieved. If the bolt breaks on tightening, it is obvious that a replacement is required. Thread stripping tends to be gradual in nature. If the thread stripping mode can occur, assemblies may enter into service which are partially failed, this may have disastrous consequences. The photograph above is from a scanning electron microscope showing a bolt thread about to strip. The joint surface interface was at the right hand side, you can see from the image that the first thread has the greatest distortion. The thread stripping mechanism is complex and involves thread bending (that occurs under the high loads) and nut dilation (which results in the shear plane moving). 1. The variation in the dimensions of the thread, (such as major, pitch and minor diameters) has a significant effect on both internal and external threads stripping strength. 2. Tensile and shear strength variations in the material for both the internal and external threads. 3. The effect of radial displacement of the nut or tapped component (generally known as nut dilation) in reducing the shear strength of the threads. The tensile force in the fastener acts on the threads and a wedging action generates a radial displacement which reduces thread strength. 4. The effect of bending of the threads, caused by the action of the fastener's tensile force acting on the vee threads, resulting in a wedging action that decreases the shear area of the threads. 5. The effect which production variations in the threaded assembly, such as slight hole taper or bellmouthing, can have on thread strength. The strength of a nut or bolt thread cannot be viewed in isolation without considering the inter-dependence which both elements have on the strength of the assembly. One of the problems in predicting thread stripping strength is that, without considering such effects as thread bending, nut dilation or bellmouthing, an optimistic result occurs. The actual stripping strength being lower than the calculated. The program FASTENER allows a state of the art analysis to be performed to determine the stripping strength of a threaded assembly. A complicating factor which can occur when a drilled hole is tapped, is bellmouthing. This is a slight taper on the hole which is usually encountered on most drilled holes to some degree. This taper extends normally for about half the diameter from the start of the hole. The cause of this tapering is torsional and transverse flexibility of the drill together with instability of the drill point during entry into the material. Bellmouthing can be minimised by the use of close fitting, well aligned and rigid drill bushes together with accurate drill sharpening. Holes exhibiting bell mouthing will, when tapped, experience a variable thread height along the length of the hole. This variation can be significant on short lengths of engagement and fine pitches. The net effect of bellmouthing is to reduce the shear area of the external threads. The finer the thread the more pronounced is the effect of bellmouthing. In tapped holes, the thread height is dictated by the diameter of the tapping drill. To reduce the risk of failure, the Design Engineer is often cautious and specifies high percentages of thread height in tapped holes. From a production standpoint these higher percentages of thread height result in higher tapping torques, increased tap breakages and, as such, are not favored. For short lengths of thread engagement, the minor diameter size - resulting from the tapping drill - has a significant effect on assembly strength. Studies have shown that for threaded assemblies of usual proportions, tap-drill size is relatively unimportant so long as the percentage of thread height is greater than 60%. Tapping costs are likely to be lower if the lowest possible thread height is used. The effect of a low proportion of thread height is to reduce the shear area of the external thread, this is illustrated in figure 1. For very low thread heights, the shear plane through the threads need not be parallel to the thread axis, this is illustrated in figure 2. Such failure modes are difficult to predict and can be easily eliminated by maintaining a reasonable percentage thread height. The tensile force present in the fastener during tightening acts on the vee threads to produce a wedging action which results in a radial displacement. This radial displacement is generally known as nut dilation and occurs in threaded bosses as well as conventional nuts. Theoretical and practical studies of this phenomenon indicate that the top face of the nut contracts in a radial direction while its bearing surface expands. The net effect of this dilation is to reduce the shear area of both the internal and external thread. The stripping strength of an assembly can be improved by increasing the width across flats of the nut, or boss diameter, up to about 1.9 times the nominal thread diameter. This increases the stiffness locally around the internal thread and reduces radial expansion. The tensile force present in the fastener during the tightening process results in a degree of thread bending between internal and external threads. Thread bending reduces the shear area of both internal and external threads. A dominating factor controlling the degree of thread bending is the ratio between the strength of internal and external threads. The strength ratio is the ratio between the force necessary to cause the nut thread to strip, divided by the force required to cause the bolt thread to strip.